In fact, I can't show you an elephant on this blog at all. It just isn't possible. To see an elephant you have to go to a zoo (or Africa or Asia). All I can show you is a representation of an elephant. Of course, this is one of those crazy obvious things we all know, but I sometimes have to remind myself. This is OK. When I show you a picture of an elephant, I'm not really trying to show you that elephant. What I'm trying to do is describe what that elephant looked like. After that, I'm just hoping that your imagination can correctly fill in the gaps to understand what an elephant is. So what I'm getting at here is that every explanation or description someone gives is only a model. Some models are complicated and some are straightforward. Some are more detailed and some are more abstract. But one thing is for sure. When someone talks about building a model, they want that model to be useful. 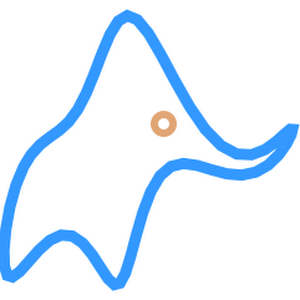 That little elephant graphic in the top left corner of the site is actually what you get if you try to fit the outline of an elephant with four parameters. 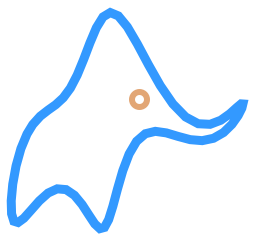 Obviously, you need a lot more than four parameters to make a convincing elephant. The idea to use four parameters comes from an old physics joke about elephants that I wrote about in this post. But real elephants are much more complex (that's an understatement). For starters, we know that there are at least 2000 different genes just related to smell. And each of those genes works differently based on the species. 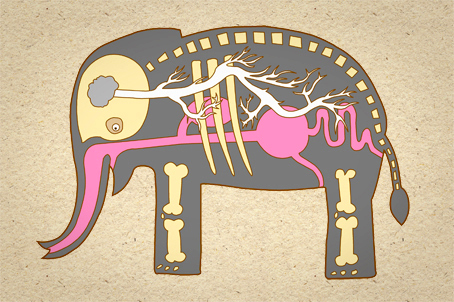 And every elephant's brain is structured just a little differently based on their memories. So yeah, it's complicated. The point of modeling in biology (or any science) is to simplify just to the point of practicality. If I want to understand how my pet elephant is going to behave, it doesn't do me any good to try to understand every gene simultaneously. Then my model would just be another identical elephant and then I'd have two elephants to take care of! That's hard work, and modeling biology is supposed to make our lives easier by eliminating some of the guesswork. So since it's not worth it to simulate every molecule of an elephant, any model is just a selective representation of the actual thing. And all models are necessarily wrong, because there is always something that can happen to the real thing, that can't happen to the model. the only perfect model for an elephant is another, or preferably the same, elephant. But this is OK because we don't actually want or need to worry about every detail. In fact, I'd say the whole human endeavor that is understanding things is centered around the following challenge: How simply can we describe this thing to get something useful out of it? Also, there's that old parable about blind men and an elephant. While it doesn't necessarily prove, it definitely does nothing to disprove my theory that humans are obsessed with understanding elephants.